Lexington Law is a trusted leader in credit repair. First-time callers receive a 100% free consultation and a free credit score. Lexington Law has been active for over two decades and has served over half a million customers. As trusted leaders in the credit repair industry, Lexington Law has helped over half a million consumers with experienced and professional credit repair. Lexington Law is a law firm with licensed attorneys and paralegals with the goal of helping you have a fair and accurate credit report. Lexington Law can remove unfair or inaccurate items from your credit report, including late payments, judgments, charge-offs, identity theft, foreclosures, identity theft, repossessions, bankruptcies, liens, loans, and collections. Although individual results vary, Lexington Law's past clients have seen an average of 10.2 negative credit listings removed across their three credit reports within the first 4 months. Once you enroll in the program of your choice, Lexington Law pulls your credit reports from the three credit bureaus (Equifax, Experian, and TransUnion) and performs a thorough analysis of your credit report to identify, dispute, and remove erroneous items. In order to keep you informed and up to date during the process, they provide 24/7 support and allow you to see your credit repair progress through an online client portal. Recognized industry leader: Lexington Law's network of lawyers has assisted over 500,000 customers. 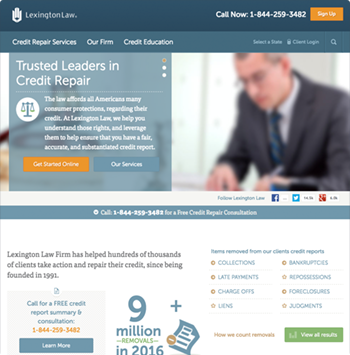 Lexington Law is recognized across the industry as trusted leaders in credit repair. Lexington Law assisted their clients with removing over 10 million inaccurate items from their credit reports in 2017 alone. No contracts: You have the freedom to use Lexington Law's services on a month-to-month basis and are free to cancel anytime. Established history: Lexington Law has been active for over a decade, so you can be sure you are in trusted and experienced hands. Wide range of removable items: Collections, charge-offs, liens, loans, bankruptcies, foreclosures, judgments, late payments, repossessions, identity theft, foreclosures, and more can be removed from your credit report. Transparently track your results anytime: Lexington Law keeps you informed on any progress through an online account that is accessible 24/7. Over the last decade, Lexington Law Firm has helped hundreds of thousands take positive action and repair their credit reports. Following a free initial evaluation, Lexington Law offers three plans for credit repair that range from $89.95 to $129.95. Concord Standard: This plan is $89.95/month and provides bureau disputes and credit interventions. Concord Premier: This plan is $109.95/month, and provides bureau disputes, credit interventions, score analysis, alerts from TransUnion, and credit monitoring. Premier Plus: At $129.95/month and Lexington Law's most popular plan, Premier Plus provides the same benefits as Concord Premier, along with cease and desist letters, FICO® score tracking based on TransUnion reports, identity protection, and personal finance tools. Depending on the state, a one-time work fee will be charged 5 to 15 days after signing up. Clients are offered a one-time $50 discount for active military and a one-time 50% friend and family discount. If you are not satisfied with their services you may cancel anytime, although a final payment will be charged after cancellation for any previous work performed. How does Lexington Law compare to its competitors? Lexington Law is an established and experienced credit repair service that we rank number #2 in the credit repair industry. They have been in business for over a decade and in 2017 alone, they removed over 10 million erroneous credit report items for clients, which is the highest in the industry. They are also one of the few credit repair services that offer their services in all 50 states. Lexington Law serves the most clients in the nation and has been in business since 1991. Callers receive a TransUnion summary report, a free FICO® score, and the chance to discuss their credit score and credit report with a credit consultant. What happens if I decide to enroll? If a caller chooses to sign up after the free consultation, they are charged a $14.95 fee for their TransUnion, Equifax, and Experian credit report. The other fees are not charged until five days after signing up. There is a First Work Fee depending on the plan you choose. The Credit Repair Organizations Act (CROA) sets tough laws to ensure company compliance and protect consumer rights. For example, the CROA states that no credit repair organization can bill a customer until services are performed. However, many companies charge a setup or “first work fee” in order to acquire credit reports. A for-profit company must also accurately inform you of what they can and cannot do in addition to providing a written contract and allowing the contract to be canceled within three business days of signing. If you ask, a legitimate company will inform you that you have the right to fix your own credit. Companies that guarantee to erase bad credit or raise your credit score by a high amount very quickly is a red flag. Because Lexington Law follows all of these rules, they are a trusted credit repair service. Because of the CROA, no credit repair company can guarantee the removal of bad credit. However, Lexington Law is a reputable company and many clients report an increase in their credit score due to an accurate and fair credit report. Is there a couple or family discount? Yes, Lexington Law does offer a family discount. If you sign up a friend or family member within 72 hours of your sign up, you will both receive 50% off your first work fee. What are Lexington Law's hours? Lexington Law's call center can be contacted Monday to Friday 8 am - 12 pm ET, Saturday 9 am - 11 pm ET, and Sunday 9 am - 10 pm ET.